The Cancer Moon is protective and nurturing, but can also be defensive and possibly passive-aggressive if we feel challenged or threatened when the Moon squares Mars later today. The Moon is in Cancer all day (until Sunday, March 29th, at 1:47 AM). This is a good day for bonding with family or simply getting into better touch with your feelings and emotional needs, Aries. Even so, there may be frustration if family or domestic demands interfere with your personal plans or sense of independence. You are entering a cycle today that can bring benefits from working behind the scenes, or in which you are working more determinedly and happily on your own. You may need more solitude in order to get an important project done, and you have a stronger need to regroup and recoup your energy. Some of you can be doing a lot of supporting of others in the coming weeks. Watch, however, that you don’t devote yourself to people who don’t deserve the attention, or who take you for granted. Something to watch for today: a Moon-Mars square activates your third and twelfth solar houses, and this combination can trigger all sorts of sensitivities. Watch that you don’t speak prematurely about a matter. You might regret it later on. Also watch for impatience with communications and secrets in general. You’re much better off talking about problems coolly with a trusted friend. 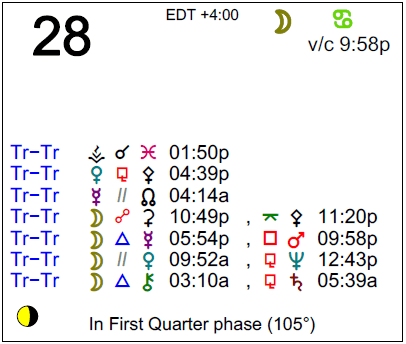 Today, Vesta enters your solar eleventh house, where it will transit until the first week of June. This is a good cycle for working with others towards a common goal, or simply for working towards a cherished dream independently. Focusing on long-term happiness goals is, in fact, healing at this time. You are a person who approaches your work and responsibilities in an unusual and intuitive way, Gemini. Vesta is now influencing the sector of your chart that is in charge of these things, until the first week of June, and this helps you to focus your energies on satisfying work and goals. You are more patient, focused, and persistent in the pursuit of your goals during this cycle, and you could be doing a lot of organizing, leading, and managing now. Today encourages a focus on practical and sensual needs, and can be strong for really getting things done. 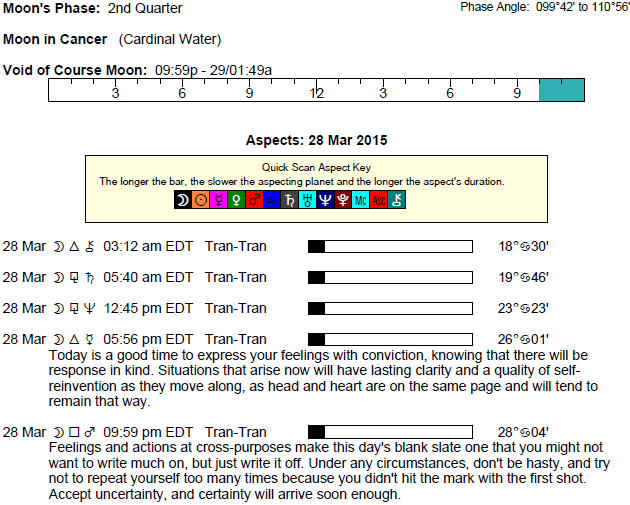 However, there is also temperamental energy later today, and you could be distracted by challenging social problems. It’s a little too easy to get frustrated now, particularly with pushy people. The Moon is again in your sign all day, dear Cancer, only leaving it early into the day tomorrow. Emotions are immediate, and needs can feel urgent. Today’s Moon-Mercury trine can really facilitate the ability to talk about your feelings, wants, and needs. However, a Moon-Mars square can point to impatience and taking things very personally, particularly if there’s pressure coming from a superior. Fortunately, you are entering a cycle today that lasts until the first week of June that helps you to focus and concentrate on what truly matters. Prioritizing comes a little more easily during this cycle. A cycle that begins today and runs until the first week of June brings wonderful energy for work, research, and self-renewal, Leo. This can be a time of strong dedication to a special project or pursuit, and you may find that you’re so motivated and intrigued with what you’re doing that you work tirelessly. For some of you, there can be a real commitment to understanding yourself and your inner motivations during this cycle, and healing energy is brought to your intimate world. Counseling or therapy can be especially rewarding now. Today, relax, renew, and recharge with the Moon in your privacy sector. Distractions are likely, particularly tonight, but you’re likely to deal with challenges more confidently tomorrow. You are entering a cycle today that puts a lot of focus on taking special care of your relationships, dear Virgo. You might find that someone is especially helpful to you for getting things done, or that you work very well in a partnership. There can be someone special who helps motivate you to set important work or projects in motion. It will be important that you stay active in a partnership, or you could feel frustrated. An active purpose or focus is important now for your relationships. Partnerships can be healing on some level in this cycle that lasts through to the first week of June, although you should be careful not to put so much time and energy into them that you ignore other life departments, or your own needs. The coming weeks are powerful for bringing more order and structure to your daily routines, for committing to a work project or to a health and wellness program, and for truly enjoying the work you do or services you provide. Feeling useful is especially satisfying now, Libra. Today is also strong for taking care of business. However, you may not always feel in charge of your own life. In fact, at times you could feel that others are trying to control you or that life is demanding too much from you. If this is the case, tonight’s Moon-Mars square can stimulate a temper tantrum or a strong need to take action and take charge. Today, you are beginning a cycle in which deep satisfaction can come through committing yourself to a creative project or hobby, Scorpio. This can be the beginning of a rather inspired, creative, and motivating period. Some of you could be putting a lot of energy and time into a romantic relationship. As long as you stop short of doing this to the point of obsession, this can be a great time for feeling focused and purposeful. Creative pursuits, and time alone spent on expressive or leisure activities, can be felt to be healing. Today’s energies are adventurous and spirited for you, but a little temperamental as well, as there can be plenty to distract you. You’re beginning a cycle in which focus on home and family can be very healing and satisfying, Sagittarius. You might be working from home, or working on the home, and this can be rewarding. Building your closest relationships and dedicating yourself to family or domestic concerns can help you feel more secure and confident. Today, you can be taking things more to heart, and at times you can be especially sensitive. Mixed signals are hard to read in your relationships, and attempting to find meaning in them, or filling in blanks, may only confound the problem. Try to ride things out and avoid blowing something out of proportion now. Today can be good for learning more about, and understanding, important people in your life, Capricorn, but there can be some temperamentality involved if you’re feeling pulled in too many directions. If you get the sense that others have too much say in your life right now, you can become quite irritable today. The trick is to get in touch with what you may be resentful about and try to clear the air. You are entering a cycle today in which you have a building interest in projects, learning, and communications. While you may be a little detached as you throw a lot of attention into your interests and work, this is a strong period for making significant headway. Others are also drawn to your advice and intelligence during this cycle. You are taken seriously. Today should be good for taking care of business, Aquarius, from the ground up. You need to focus on the little things and the loose ends. Emotional satisfaction comes from getting your affairs into order, organizing, staying on top of things, and helping others or being “of use”. However, distractions can abound later today, and someone could really grate on your nerves. It can be difficult to do so with the nervous energy around you, but try to center yourself. A new cycle begins today that brings a stronger focus on making your life more secure. You can be especially focused on earthy, comforting, and natural activities that help you to heal and cleanse. The coming weeks are powerful for commitment to a personal project or your work, dear Pisces. This is a time for going your own way and for independent work. 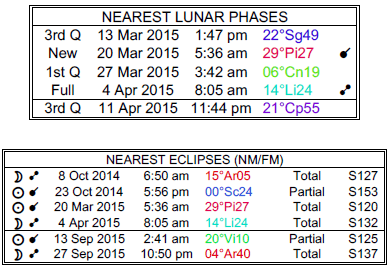 This can be most prominent after the Lunar Eclipse on April 4th, when work and daily life can really speed up. Your dedication and commitment are more obvious to others, and you may be recognized for these traits, although there can be times when you’re so focused on your needs and projects that people in your life feel a little left out. Today, you can be excited to share your ideas and feelings with others, although later today, there may be a difference in values or disagreement about money. If Your Birthday is March 28th, If Today is Your Birthday full horoscope here. You have common sense and self confidence. You take on responsibilities with a sense of ease. You are organised and work consistently and well for success. You have a tendency to be extravagant and self-centred. You enjoy the fun side of life, but when the going gets tough you lose interest and wander off for greener pastures. Moon 07° Scorpio 25' 33"
Mercury 03° Aries 32' 37"
Venus 29° Pisces 14' 26"